Perhaps to this day, many people still know the black-legged tick by its former name deer tick. Active in each of its stages being the larva, nymph and adult, it takes 3 years to complete the cycle and at each stage, blood is a vital sustenance. The stage that follows after the egg hatches and usually takes place from May to September. The typical hosts it clings to are smaller animals like mouse or bird. It is difficult to spot a tick at this stage; its size being close to a speck of ground pepper. It will molt into nymph stage following a sufficient feeding and await the next spring. The activity in the second stage of a deer tick takes place starting the month of May as they begin to seek another host to feed on. At this stage, it has grown from a mere speck to about the size of a poppy seed. It is possible at this stage for this tick to transmit diseases it may have picked up during feeding from infected hosts during its previous stage. By fall, a nymph would have developed to become an adult blacklegged tick – scientific name Ixodes Scapularis. Their color is either red or orange and the female would feed, mate, lay eggs then die. Without blood supply, they simply stay dormant throughout the winter season and become active again in the spring, having survived the cold temperature. On an empty stomach, the typical size of the female ranges from 3 to 5mm in length, the male slightly smaller. Feeding takes from 3 to 5 days. Disease transmission through feeding is not immediate; the tick has to be attached for at least 24 hours. Majority of these ticks can be found in areas that are wooded, humid and damp. They thrive in such areas because of the moist provided and the abundance of hosts to cling to such as deer, hence the ticks’ popular name. The animals present in these ticks’ habitat provide the blood supply they need in each life stage. Distribution in the United States is thick in the northeast and the upper midwest. While deer ticks are known to be responsible for Lyme disease, it is not transmitted in all areas where they can be found. The reason likely lies in the fact that the bacteria that causes the infection are sustained in wild rodents and other small creatures in their habitat. 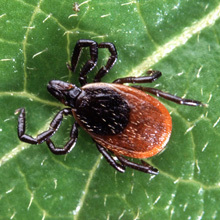 In the abundance of smaller animals as hosts, they are unlikely to bite humans until an accidental exposure where a tick gets attached to a person. Still, where there is thick population, so is the risk. Risk of exposure is high in forested areas and along trails and where there is deer population. When a host happens to rub against a grass or vegetation where a tick is hiding, it seizes the chance to attach itself to the host. These ticks are not able to fly neither can they jump, contrary to what some people believe. Black-legged ticks get to their prey by crawling up from their hiding places. Despite being known as a deer tick, they can still be found in areas where there are no deer. Lyme disease pathogens are transmitted through the bite of an adult tick or nymph but not after ample amount of exposure. The tick has to be attached to its host, person or animal, for 24 to 48 hours. Although they are on certain instances brought inside the home by accident, most black-legged ticks don’t survive the generally dry atmosphere indoors. Because of the potential danger that deer ticks pose to animals and humans, the best thing to prevent the spread of the disease they carry is to control their population. Since they flourish in moist surrounding, keep your homes clean and dry and your lawn leaf litter-free. If there are any trails or paths leading to wooded areas near your home, see that they regularly cleared of undergrowth.